The tectonic evolution of the Rhodope massif involves Mid-Cretaceous contractional deformation and protracted Oligocene and Miocene extension. We present structural, kinematic and strain data on the Kesebir–Kardamos dome in eastern Rhodope, which document early Tertiary extension. The dome consists of three superposed crustal units bounded by a low-angle NNE-dipping detachment on its northern flank in Bulgaria. The detachment separates footwall gneiss and migmatite in a lower unit from intermediate metamorphic and overlying upper sedimentary units in the hanging wall. The high-grade metamorphic rocks of the footwall have recorded isothermal decompression. Direct juxtaposition of the sedimentary unit onto footwall rocks is due to local extensional omission of the intermediate unit. Structural analysis and deformational/metamorphic relationships give evidence for several events. The earliest event corresponds to top-to-the SSE ductile shearing within the intermediate unit, interpreted as reflecting Mid-Late Cretaceous crustal thickening and nappe stacking. Late Cretaceous–Palaeocene/Eocene late-tectonic to post-tectonic granitoids that intruded into the intermediate unit between 70 and 53 Ma constrain at least pre-latest Late Cretaceous age for the crustal-stacking event. Subsequent extension-related deformation caused pervasive mylonitisation of the footwall, with top-to-the NNE ductile, then brittle shear. Ductile flow was dominated by non-coaxial deformation, indicated by quartz c-axis fabrics, but was nearly coaxial in the dome core. Latest events relate to brittle faulting that accommodated extension at shallow crustal levels on high-angle normal faults and additional movement along strike-slip faults. Radiometric and stratigraphic constraints bracket the ductile, then brittle, extensional events at the Kesebir–Kardamos dome between 55 and 35 Ma. Extension began in Paleocene–early Eocene time and displacement on the detachment led to unroofing of the intermediate unit, which supplied material for the syn-detachment deposits in supra-detachment basin. Subsequent cooling and exhumation of the footwall unit from beneath the detachment occurred between 42 and 37 Ma as indicated by mica cooling ages in footwall rocks, and extension proceeded at brittle levels with high-angle faulting constrained at 35 Ma by the age of hydrothermal adularia crystallized in open spaces created along the faults. This was followed by Late Eocene–Oligocene post-detachment overlap successions and volcanic activity. Crustal extension described herein is contemporaneous with the closure of the Vardar Ocean to the southwest. It has accommodated an earlier hinterland-directed unroofing of the Rhodope nappe complex, and may be pre-cursor of, and/or make a transition to the Aegean back-arc extension that further contributed to its exhumation during the Late Miocene. 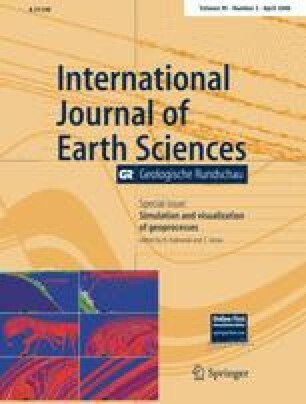 This study underlines the importance of crustal extension at the scale of the Rhodope massif, in particular, in the eastern Rhodope region, as it recognizes an early Tertiary extension that should be considered in future tectonic models of the Rhodope and north Aegean regions. Constructive reviews from B.C. Burchfiel and D.A. Dinter, their valuable suggestions and critical comments on the manuscript are greatly acknowledged. Part of this work was carried out while NB was holding a scholarship from the French Ministère des Relations Extérieures, in Montpellier.